There was a time in my younger life, when I was more inclined to take things at face value, or superficial appearances, without actually delving into the reasons for or the aftermath of, the doing away, or at other times, the instituting of policies and programs. It seems that the millennial generation is afflicted with the same shortsightedness that I suffered from, when it comes to things like socialism and nanny state politics, having been, at least in many cases, indoctrinated by flower child college professors and ideologues who seem to believe that the money passed out by government programs either grows on trees or can be printed, ad infinitum, an unending supply of currency guaranteeing cradle to grave security for the industrious and non-industrious alike. If that is the case, socialism is definitely the epitome of insanity, in that it has been tried over and over and always arriving at the same result. A government that has grown so bloated with bureaucracies to watch the other bureaucracies while administering everything from food distribution to doctor visits, with the legislative element passing ridiculous regulations and promising more and more benefits, until there are no more lines of credit, the tax base has maxed out, the party is over and the government is forced to take action to control riots and demonstrations. But the current generation has never been taught about the disaster of socialism, and view it as a wonderful level playing field where all needs will be met by a benevolent motherly government. And when the case for abolishing the Electoral College is presented to them by the politicians and ideologues, it will be done in the name of fairness, a system where every vote would be counted and the true majority would - at last - have their voices heard. Which means that the only representation the flyover states would have would be the Senate and you can bet the loyal opposition would make short work of their influence. The open borders policy, lowering the voting age to 16, the intention to pack the Supreme Court and the abolition of the Electoral College is a brazen attempt by the Democratic Party, to control every elected official, every federal judge, every bureaucrat, every law passed, everything from tax rates to hospital stays. Don’t be deceived, it’s not compassion or empathy that prompts these Democrats, it’s the unholy quest for power, the same passion that cost Satan his place in heaven and will eventually cast him into eternal hell. People who crave power have tunnel vision, all they can see is being able to control the lives of others, it is the most potent drug of all and eventually drags its addicts down to the bottom of the cesspool they live in. Put simply, doing away with the Electoral College would disenfranchise around 80% of the geographical area of the nation and place unlimited political power tantamount to that of a dictator in the hands of politicians who would totally ruin the industry and economy, cut the military to dangerous levels, cower and kowtow to foreign governments, take away any citizen’s right to own firearms and reduce the constitution to a list of toothless suggestions. Well, folks wake up, its only one election away. God bless you Charlie. I am paraphrasing when I say this, but Plato said, if we don't become involved in politics we will be ruled by our inferiors. Yep, that's exactly what were getting. And the frustrating part of it for men like me, and I'm sure like you also, you can't grab one of these weasels and administer a little curbside justice. I think this is going to get worse before it gets better. You and our President and the rest of this country are in our prayers. Obama brought out a new breed of democrat. When they voted for change, it wasn’t subtle changes they were looking for . They want to destroy this country as we know it. Jealous of success they want to bring everyone down to the lowest level and ridicule personal responsibility. You are so right Mr. Daniels. If we don't stand up an vote for people who want to keep America free, then it will become nothing more than a dictatorship I am very afraid there will be bloodshed right on American soil once again,because true Americans will not be pushed into a country without freedom. Freedom has cost lives before in this country an it will again. 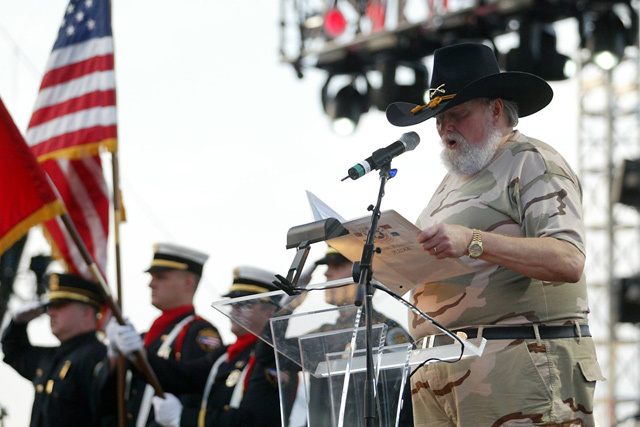 Charlie Daniels for President 2024! You are 100% spot on. Why doesn't the citizenry see through the Democrats attempt at a power grab? The liberal media protects the Democratic agenda, squashing any speech that exposes them for their true selves. On another note... I had the great pleasure of seeing your concert in Springfield, MO recently. That was fantastic! Thank you so much! I totally agree with your assessment of our government. All I can say is Amen. I fully understand what you are saying about having your 2nd amendment rights. But how can we not live in fear? Everyday, more and more innocent lives are being taken due to one person who has gotten their hands onto a weapon of mass destruction. Being a high school student, there isn’t a day that the thought of “what if...” goes through my mind. How do you think we can prevent these tragedies from happening without banning guns? What other ways do you think can help us? I just wanted to let you know that I was at the Grand Ole Opry Tuesday, March 19 and saw you perform. WOW! My husband and I just loved it! I wish I had your energy! By the way - thank you for playing your new song for us. We think it's great! Blessings to you and your family. Thanks so much for all you do. Saw you the first time you guys played at Volunteer Jam, what a thrill for a young soldier, have been a fan ever since !